Sea kayaking is a thrilling activity but one fraught with danger pitting the primitive paddler against the wild elements of the wind and the open sea. Sea kayaking is touring the open sea in a small paddle-powered vessel. Sea kayaks are seaworthy vessels with a covered deck and optional spraydeck, to prevent water entering from entering the boat. Sea kayaks are not designed for extreme manoeuvrability but cargo capacity, ease of straight line paddling and to be comfortable on long journeys. Kayaking on the open wave is a safe and worry free activity for the majority of participants. Nevertheless there is always a certain degree of risk involved with an activity that relies on such unpredictable elements as wind, water, weather and the medical conditions of its kayakers. The ease at which the skills to kayak confidently can be picked up can sometimes work against the sport. For example a novice can easily paddle unknowingly into tricky situations a more experienced kayaker would know to avoid. The key to enjoyable, stress free kayaking is not to try to eradicate the risks but to be aware of them and manage them responsibly. Participants of all ages and abilities can part. They do not need to be strong swimmers because they should all be equipped with buoyancy aids to keep them afloat, but an average swimming ability and confidence in deep sea water is recommended nonetheless. To begin sea kayaking safely it is strongly recommended to first book an introductory trip with a qualified kayaking group or to join a local club. Many clubs run pool sessions where beginners can learn the basics in warm water. Alternatively novices could get to grips with the essential skills by hiring a kayak and taking it out on more forgiving waters such as a river or a lake. When heading out to sea without supervision one should not travel alone. Many experienced paddlers believe that a minimum of three kayakers is essential for anything beyond an easy shore paddle. Nevertheless the ability and judgement of the individual paddler is still more important than safety in numbers, which can just merely multiply the chance of getting into difficulties. It is, for instance, better to travel with one experienced kayaker than three novices. The most important piece of safety equipment for any sea kayaker is the personal floatation device (PFD). This should be worn at all times because it could prove difficult to put on whilst out on the water. However bright and sunny it may be kayakers should also take warm clothing because it can get very chilly out at sea, and also the weather has nasty habit of changing suddenly. The second most important piece of equipment is a means of communicating with the shore. These ‘toys’ take two forms – the primary are those that raise the alarm and the secondary are those that attract the potential rescuer’s attention. All kayakers should take at least one of each with them on their trip. These toys include flares, VHF radio, whistle and the mobile phone. Although the latter is a valuable piece of kit that most people own, it is important to not rely on it solely, as it may be adversely affected by bad signals or water damage. Check the local tides and weather forecasts and be aware of any potential swell – the weather from the previous few days. Check trip route for ‘bale out’ beaches and harbours, and work out the points of no return for opening crossing and exposed coastal sections. Make sure somebody on the shore knows the journey details and estimated time of return. Check the equipment kit to make sure everything is included and in full working order. In the unlikely event that something untoward does occur on an unsupervised sea kayaking trip, it is important to keep calm and delegate one person to charge and provide clear-headed leadership and to stay with the kayaks. In an emergency situation in order to head home and bale out as quickly as possible the direction of the wind and tide and the proximity of any beaches or harbours should be decided on. 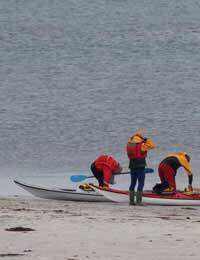 If kayaker happens to capsize their vessel it is essential they never lose a firm grip on the kayak and paddle, as these provide not only buoyancy and a means to return to shore but a beacon for potential rescuers to spot.